Sandhya had moved on from Dr Shroff’s Charitable Eye hospital – and Zani’s cause was brought up in March 18 by Sanobar – another young one with a soul and a passion to support the unfortunates. Zanista, a 4 year old girl was suffering from several problems since she was born. Her body turned completely black with rashes all over her body due to allergy caused by baby oil when she was just 10 days old. 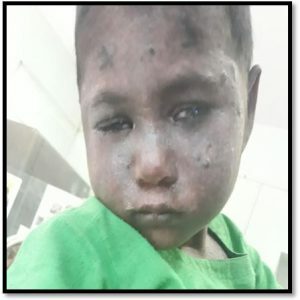 This is not all, life became tougher for this child, when her vision started deteriorating, she is not able to open her eyes in sunlight with itching and redness in both her eyes and blurry vision. Zani was brought to SCEH, where after complete check up, she was diagnosed with Cornea Scar and recommended surgery for the same. Her father is a labourer in Rajasthan, who does not have a fixed income, getting one time meal is a difficult task for him. Hence he cannot bear the cost of her daughter’s surgery.